We’d love your help. 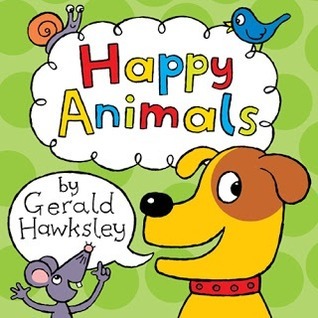 Let us know what’s wrong with this preview of Happy Animals by Gerald Hawksley. Happy frog, on a log. Happy owl, in a tree. Happy ducks. One, two, three. A book of happy animal pictures with simple rhyming text, and a happy ending! To ask other readers questions about Happy Animals, please sign up. There is a rhyming scheme, which seems a little forced at times. Dogs, frogs, tree, three, etc. Despite this, I think the book was a fun book for the younger ag This book was a super cute picture book about happy animals! There is a rhyming scheme, which seems a little forced at times. Dogs, frogs, tree, three, etc. Despite this, I think the book was a fun book for the younger age group (one year to five years maximum, in my opinion). It's definitely easy to read along with, and could be read in a silly song to make the book more fun and interactive. For a picture book, it's rather long! It's well past 20 pages of colourful pages with happy animals. Overall, I think this book is very sweet! It's the perfect book to introduce young readers into the world of literature! I'd also recommend this book to a kindergarten or daycare class learning animals, because it's fun and colourful enough to make a lesson out of. The name says it all. This is a delightful rhyming picture book sure to put a smile on the faces of all its readers and young listeners. The pictures are uncluttered, bright and attractive, while the text is simple, repetitive and engaging. I'm sure this will be much enjoyed by young animal lovers. I can just imagine my now 22 year old son loving this 20 years ago. And as a bonus, the kindle version includes Sleepy Animals. What a great package. The pictures were nice and the words were easy to read in a simple, flowing way. I loved reading it from beginning to end. Carmine and I enjoyed the pictures in this book. Excellent rhyming but no real substance to the book. ‘Happy animal, happy animal, happy animal, rhyme to second.’ Nothing else. I downloaded this book because I loved Happy Hat Day and Ghosties by this author. My son said to give it five stars but I was disappointed. It is nothing like Happy Hat Day and Ghosties. However being that my son could read it to me made it worth it!!! I plan to download many more of this authors books!!! This is a colorful bright picture easy reader book --- great for colors, animal identification. Little children cold pick out words they know and maybe start a picture with the colorful pictures of the animals in the book - or figure out what they were happy about! Also include a free book: Sleepy Animals which is the same type of book but all of the same animals are now tired! Cute and imaginative! I really liked this book. It has a positive vibe to it because it shows many animals smiling and being happy. It would be very easy for children to read because there is no high vocabulary words. I really enjoyed the illistrations. They were good pictures and made me happy! It also has a nice rhyme, such as "happy cat, happy dog, happy frog on a log". Very cute book for children to read and relate to! I chose this for it being such a haooy and educational ebook. Plus a short & simple one. Very colorful,too. I wish to recomnend this for kids ages 0-5 & or in grades P-K. This was a cute kids book which basically just consisted of picture of smiling animals. Quite repetative, but my 4-year-old liked it. He wasn't sure what a 'gnu' was though (apparently it's a wildebeest - thanks kindle dictionary). Lovely bedtime story for younger children. Very nicely illustrated book , 2 short rhymes with lots of pictures to keep little ones happy, my 2 year old loves it, and so do I because it's a short read ! The illustrations are adorable. The variety of animals are good. Definitely cute enough to read to children, as well as by myself. I'm planning on reading it to my 7-year/old, animal-loving son. We have several books by this author. This particular one we got for free in ebook format. The illustrations are cute and eye catching. The toddler giggled most of the way through. Easy rhyming makes it fun enough to hold his attention span for the whole book. Another good book from Gerald Hawsley. I've liked everything of his we've read so far. Very cute illustrations, easy wording (my little guy read it to me), nice flowing rhyme. Read on the Ipad Kindle app. Happy Animals is a cute children's picture book with an added bonus book included. Both stories are wonderful to read to young children or for early readers to read to themselves. Simple but cute pictures of happy animals, with a message to take care and love animals in all forms and sizes. Very cute, bright colors and rhythm, great for teaching toddlers about animals. I read this book to my 5 year old son. He enjoyed that it was short, full of colorful pictures, and had some rhyme. I do recommend this children's book. Cute book. Very simple, for toddlers. Great for a toddler or even a beginning reader as the rhyming text and variety of animals make this one quite cute. Such a fun simple book. Easy for little ones to pretend to read along by saying the names of the animals. Cute illustrations, whimsy rhymes and bright colors will capture your toddler's attention. there is no story in this book. the pictures are very cute! would definitely recommend this book to kids who love pictures, painting, and animals! Holds a toddlers' attention, and would be a great book for early readers. I wouldn't hesitate to recommend this for both age groups. I would recommend to everyone! Simple, recognizable, colorful illustrations. One sentence per page story line. Great for children learning to sit still. I look for books with simple pictures having bright colors. This book has both making it good for language development. Activities from repeating words about those pictures to saying their own sentences is how this book could be used as a piece of teaching material. This book can also be a fun book to read with kids. This book is simple, rhythmic, colorful and informative. Any child would enjoy it. The book was cute. My grandbaby enjoyed the pictures and story.